Indeterminate (vining) tomatoes are very vigorous growers, and if they’re neglected they can easily become overgrown, with multiple tangled branches sprawling across the ground. If this happens to your tomato plants, all is not lost. In fact, you can take advantage of the situation to make the plants even more productive, and tidy them up in the process, using a technique called layering. In Permaculture’s design principles, we have the Attitudinal Principle – Everything Works Both Ways. Whether we see something as positive or negative, as a ‘problem’ or as a useful resource, depends on our attitude. Typically, people see a disadvantage as a ‘problem’ and then implement an energy-intensive ‘solution’ to attempt to ‘fix the problem’. The other option is to take a different attitude, look at everything as a positive resource, and figure out how to make use of it! We can get creative and think of all the ways we can turn these disadvantages into useful things we can use in our system. In this article we’ll look at one such practical application of this principle. 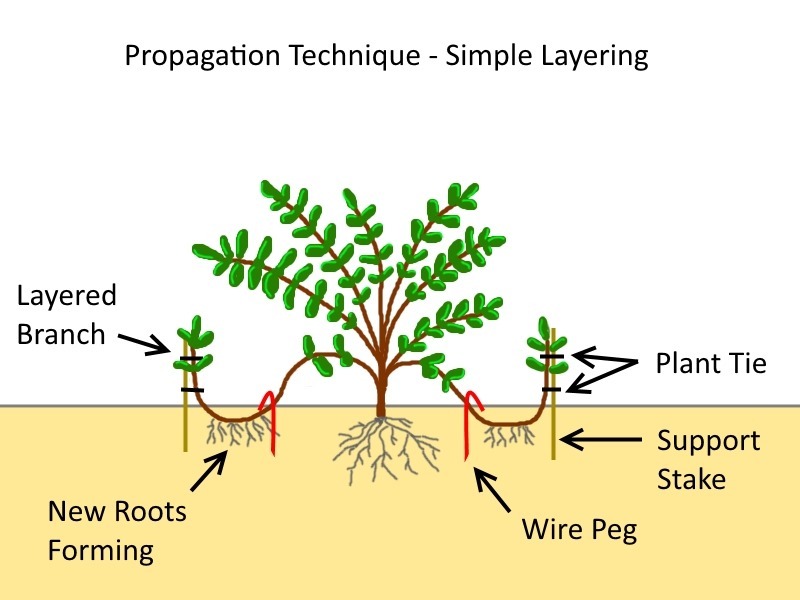 Layering is a propagation technique where a portion of plant’s branches are buried below the soil in order for them to produce roots. Sometimes, the underside of the branch is scraped to injure the outer bark (to expose the green cambium layer underneath) or surface layer (in herbaceous non-woody plants such as tomatoes) in order to promote root growth. Additionally, the scraped underside of the branch can be treated with rooting hormone to enhance root production even further. The branches which are layered are held in place beneath the soil with upside-down ‘U’ or ‘J’ shaped wire pegs such as weedmat pins or irrigation pins, or homemade fateners made out of coathanger wire. Alternatively, heavy stones or half-bricks can a;so be used for the same purpose. Once rooted, the branches are cut off the parent plant to produce separate plants, but with layering tomatoes they don’t have to be removed at all! It’s important to keep in mind that the technique of layering will only work with plants that are suited for propagation with this method. Any one propagation technique will not work with every plant, which is why we have so many propagation techniques, such as grafting, growing from cuttings, division, and so on. 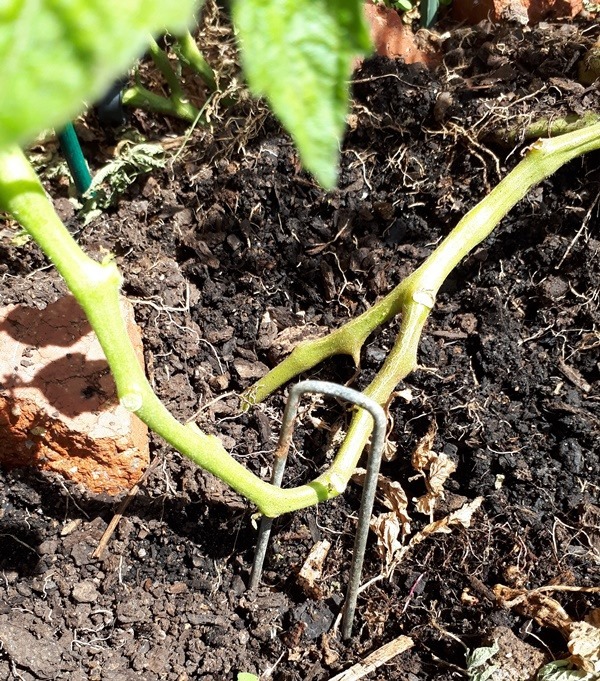 One of the interesting features of tomato plants is that if they’re planted deeper than normal, the section of the stem below the ground will also grow new roots. 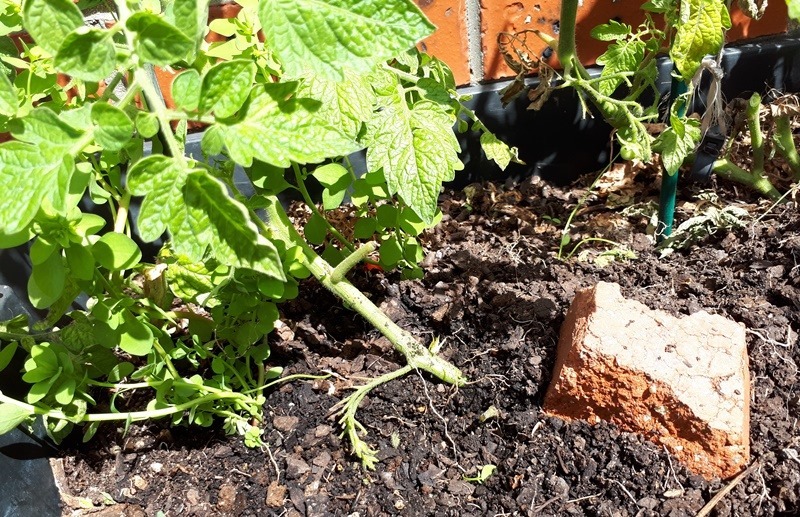 Many gardeners take advantage of this phenomenon and plant their young tomato plants deeper into the soil, allowing the plant to start off with its roots deeper into the ground to access more water and nutrients, leading to faster establishment. Similarly, when tomato plant branches are buried in the soil, they also sprout new roots, making them suitable plants for layering. Separate and untangled the branches from each other. Lay the braches down so that they’re spaced apart at the same distance that you would plant individual tomato plants. Anchor branches in place beneath the soil. Stake ends of branches vertically. To get an idea of spacing, we can look at example which I’ve prepared. 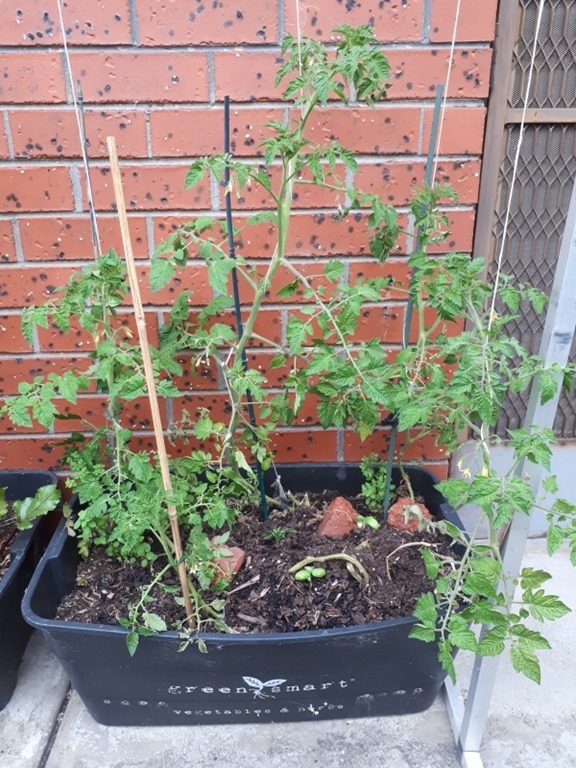 Pictured below is a self watering planter in which appears to be growing five tomato plants, but actually there’s just one plant with five branches in there which has been layered. This plant was a self seeded cherry tomato which grew very late in the season and survived right through winter, becoming quite heavily branched and overgrown. It’s well ahead in terms of growth, as it’s only the start of tomato planting time here where I live, yet this plant is already producing its first tomatoes! It would be a shame to prune it back and lose a lot of productive growth, so instead it can be further encouraged! If we take a closer look at the potting medium, we can get a better idea of what’s going on here. The dashed green lines show where the branches originate from the main root. 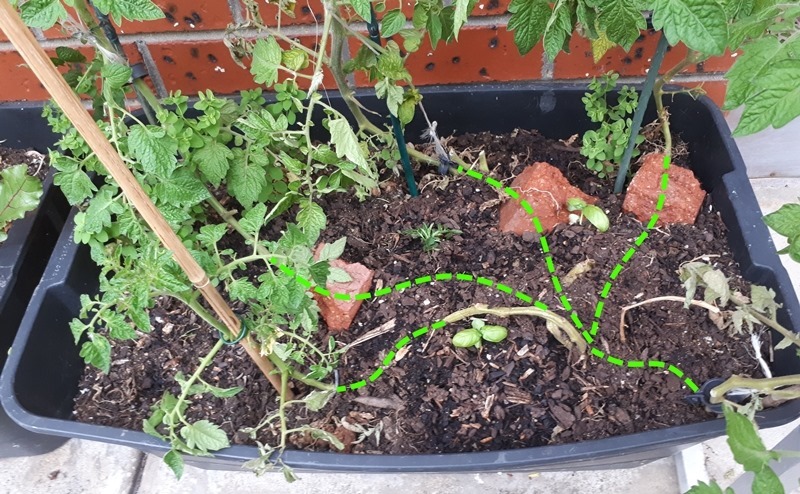 From the diagram it should be a bit more obvious that the big pieces of broken red brick are there to hold the stems down below the soil. Taking a closer look at a layered branch, it comes up from the main root, and runs below the soil where it’s held in place with a weedmat pin. the end of the branch is supported vertically with a bamboo plant stake, and it’s held there with a wire plant tie. To layer the branch, simply dig a narrow trench in the soil, lay the branch down in it, then anchor it in place with a weedmat pin. 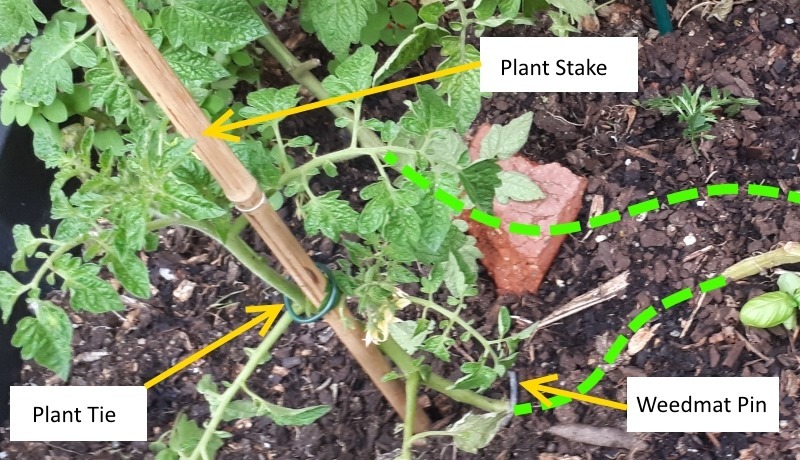 Cover with soil, then stake the end of the stem vertically. If using a rock to hold the branch down, once again, dig a narrow trench in the soil to lay the branch down in, hold the branch down by hand and cover with soil, then place a reasonably heavy rock on top of the soil to anchor the branch down. Once that’s done, stake the end of the branch vertically. This entry was posted in Gardening Information, Permaculture, What's New! and tagged Attitudinal Principle, Everything Works Both Ways, layering, Permaculture design principle, propagation, tomato growing. Bookmark the permalink. Thank you again Angelo from over the years your help in so many gardening areas including worm farms, pests, mulch, plants etc. Also Love these posts, I Always learn something new and you simplify with good explanations and photos/diagrams. You are a treasure. Thank you for your generosity. Hello Angelo, what are the ‘strings’ ? with the hooks at the top please for the plan to climb up and where can I buy them? The hydroponic support strings were purchased from Gardensmart Hydroponics at Gardenworld. They can be constructed out of coathanger wire and string as a DIT project too! Why did I not think of this before? Thank you so much for this inspirational post! I knew I could root suckers easily; but I never once thought to layer the crawling vines! This will definitely be done next year, especially during the mid to late summer, when the vines really venture all over the place and production drops. I cannot wait to try this with the Purple Cherokees, in particular!